and rehashing old family stories. Prepare the house or apartment with Christmas decorations. No matter what your participation is, look for ways to talk about how thankful you are for what Christ as done for you. Use moments that are appropriate to share what God has done in your life. 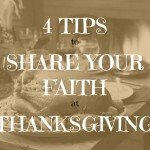 Here are 4 tips to being intentional in personal evangelism this thanksgiving. 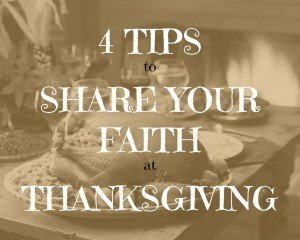 Here are some things to consider ahead of time about sharing your faith during this Thanksgiving Holiday. 1. Pray ahead of time. Ask God to make you sensitive to His leading about when and what to share during Thanksgiving. Approach thanksgiving with the idea that you’ll have opportunity to share with family and friends what you are truly thankful for: the outrageous grace offered to you in Christ Jesus. 2. Brainstorm some possible discussion questions. It may seem that discussions of Christmas shopping plans, the weather, football, are meaningless and dull. Retelling old family stories can be an embarrassing rehashing of events that would better left to the dustbin of history, or they could be a good part of family identity and bonding. But as a commenter on my prior post pointed out, these things may be valuable to your family and friends. They are points of connection and it is important to value what your friends and family value. However, during the course of discussions, you might find a natural time to talk about your faith, or raise questions that could move a conversation in that direction. What’s the one thing you are most thankful for this year? Why? Is Thanksgiving more of a time for being thankful to God or being thankful to others? How? Is it tough to be thankful this year? Why or Why not? As conversations unfold, a person might share a spiritual need, which is an expression of spiritual thirst. You might not even need to ask questions to find it. Or, questions like the ones above could open conversation paths into spiritual needs. These can naturally go on to deeper things about your relationship with Christ and the gospel. You might hear of a person’s spiritual thirst and can appropriately point them to the water of life. The key is to look and listen. You’ve been praying. Watch for how God will answer that. Read: What is Spiritual Thirst? 4. Take the time to share. If you are noticing people, spiritual thirst can lead to moments of conversation in divine appointments. (Read: Divine Appointments). Take the time to share your experience of God’s working in your life. Feel free to tell appropriate stories of God’s current activity in your life, particularly where you are thankful. Look for those moments to talk about your thankfulness for what God has done for you in bringing you salvation. Look for those “natural” conversational opportunities. 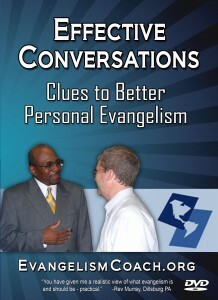 Some evangelism practitioners will not only look for conversational openings, but will create them or cause them to happen. Go for it. You might still be learning how to confidently talk about their faith and need other people to start the conversation. Either way, look for those opportunities to share and go for it.